If you'd like to see a larger picture, just click on the one you'd like to enlarge! You also see the video of this procedure by going to our videos page! Over the course of a fishing season, we get tons of questions regarding techniques and tackle while we're on the water. Perhaps the most common one (surprisingly) is what is this knot that I'm always using and how does one tie it?? Although some might consider it a 'specialty knot', the blood knot is one of the most useful knots that an angler (either fly or conventional tackle) can know. 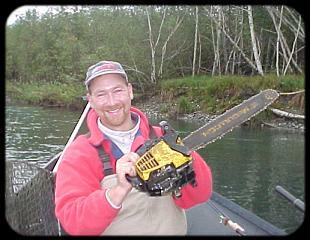 With good knots, you'll never know what you might drag up off the bottom of the river! 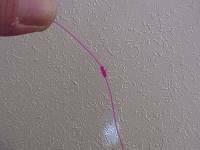 Tied properly, the blood knot allows an angler to connect two separate pieces of monofilament line at around 90-95% breaking strength of the line. Some practical uses? 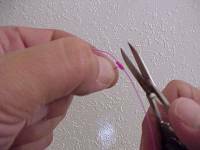 Fly anglers use it all the time to make their own tapered leaders by connecting short sections of different weight mono to their fly line for a custom leader. 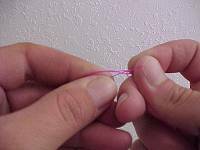 Conventional tackle anglers will the find the knot useful in connecting a clear leader to a colored line (a very common use for myself). Don't use colored lines or flyfish? 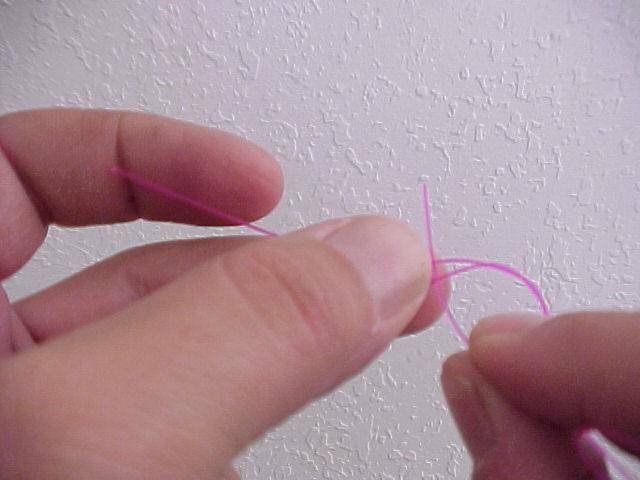 You can also use the knot to save yourself a few bucks by only filling the top half of a reel's spool by leaving a layer of underlying line (call it backing) and connecting it to the new line to be spooled up, thereby cutting down on the amount of line necessary to fill up the reel. 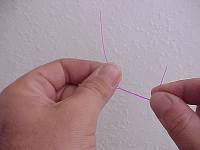 The keys to tying this knot at fullest strength possible are: using the same type of line on each side and using very similar weights (ie 12 lb. to 15 lb. - You can use different types of line, and bigger weight differences, just keep in mind that your knot strength will decrease when you do so); and using the proper number of wraps and pulling the knot tight very slowly. We'll give these instructions for a right-handed angler, simply reverse the hands if you're a lefty. 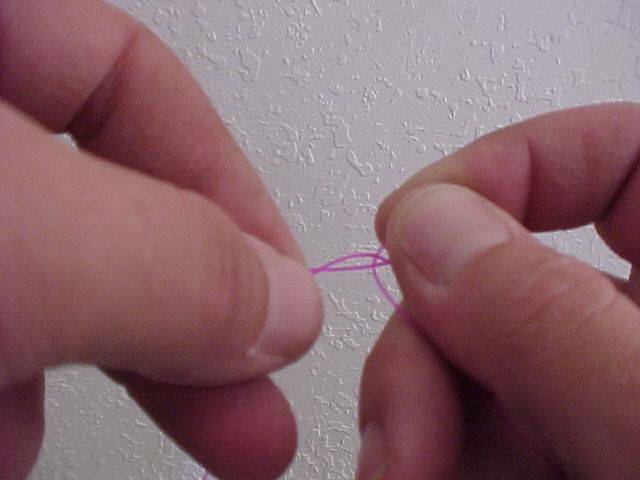 Your first step to tying this knot is to cross the two pieces of line that you wish to join in the shape of an 'X'. Make sure to leave four or five inches of line on each side of you crossing point if possible, this will facilitate easier tying. Next, grab the crossing point of the lines between your left thumb and forefinger and begin winding the tag piece of line clockwise (looking down the line from left to right) five times. 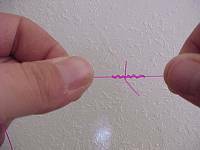 Upon completion of your wraps, pass the end of the line with which you made your wraps and slide it into the 'V' that was formed from the wrapping of the two lines. Next, grasp the two crossing lines and the end that was was just passed through with your right thumb and forefinger. Then, wrap the remaining tag end counter-clockwise (this is VERY important) five times around the line. Now pass this tag end through the loop left behind where the wraps begin. It is very important that you come through the loop in the opposite direction that the first line did. 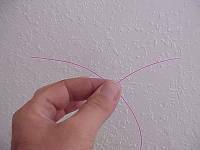 For the next step, I usually grasp the two pieces of line going through the loop with my teeth and slowly pull on the outer ends of the two lines you are joining. I firm these up just enough to where the knot tends to hold its shape. Then, moisten everything well (saliva works just fine :)) and continue pulling the knot tight. 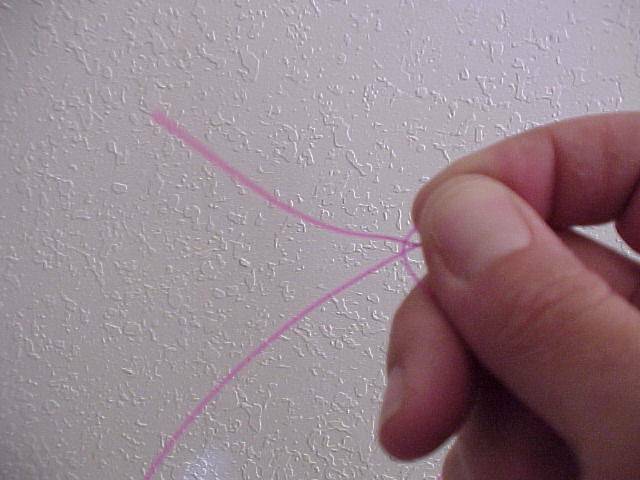 When everything is snug, simply clip off the the ends of the line sticking out from the knot and you're finished. Be sure to test your knot by tugging firmly on the line. Simple! Yes, it does take a little practice to tie this knot quickly, but it's an invaluable one that has a number of uses and should be part of every angler's repertoire of knots! Remember, if you'd like to see a larger picture, just click on the one you'd like to enlarge! You also see the video of this procedure by going to our videos page!